This webpage covers programming assignments and class-to-class information for CS 466. Practicum material will start appearing here next week. OBJ file format parser capable of parsing either triangle or quad meshes, and that works on the test OBJ files above. You can also find plenty of free OBJ models online, e.g., TurboSquid. Mesh adjacency datastructure that works with the (tri or quad) test meshes. Render the mesh datastructure's contents to illustrate that the mesh has been constructed properly using OpenGL. Use display lists to make rendering interactive. 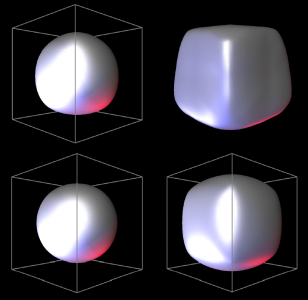 Use smooth shading using per-vertex normals computed from either the subdivision scheme, e.g., Loop limit-surface normals, or using traditional face-averaged normals. • The number of vertices in the mesh. • The number of triangles in the mesh. • The 3D coordinates of the vertices, ordered by vertex number: x0, y0, z0, x1, y1, z1, . . ..
• Three integer vertex indices per triangle. • (Optional) The keyword texcoords, followed by u and v coordinates for each vertex. • (Optional) The keyword normals, followed by x, y, and z components of a normal vector for each vertex. Code that reads the msh format is in the Mesh class of the Model assignment framework. Submit your pre-submission materials via CMS for CS 466.